MR. MUGABE Actor L. Peter Callender sports jewelry made by Healdsburg's Paige Taggart. It's clear to those who live in the North Bay that we have a stunning number of very good theater companies, all working, fundraising, and marketing their shows, often proclaiming—with hyperbolic enthusiasm—that there is no good reason for theater lovers to ever leave the North Bay. The truth, of course, is that sometimes there is. It may be heresy to suggest it (you may light your torches now) but despite the unquestionable quality of North Bay theater, there are shows worth crossing a bridge or two for. Sometimes, local artists themselves choose to become involved in shows beyond the North Bay. 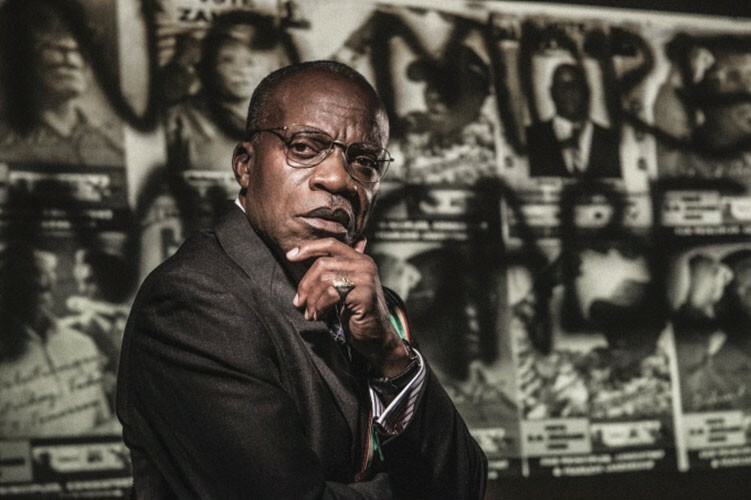 Anyone taking the drive to Berkeley this month, to catch Aurora Theatre's Breakfast with Mugabe (www.auroratheatre.org), should take notice of the elaborate jewelry worn by actor L. Peter Callender as Robert Mugabe, the despotic president of Zimbabwe. In Fraser Grace's play (Nov 7-Dec 7), a depressed Mugabe, haunted by terrifying visions, seeks the aid of a white psychiatrist. Mugabe's elaborate jewelry was designed by artist Paige Taggart, a Healdsburg native making her first foray into designing for the stage. In December, also in Berkeley, The Shotgun Players (www.shotgunplayers.org) will be revisiting Thornton Wilder's indelible fantasy-drama Our Town. Its sprawling cast includes North Bay favorites Tim Kniffin and Molly Noble as Doc Gibbs and Mrs. Gibbs. Berkeley Repertory Theater (www.berkeleyrep.org) has extended its run of Party People through Nov 30. Created by the innovative hip-hop performance troupe UNIVERSES, Party People rocks-and-rolls its keen-eyed way through the revolutionary history of the Black Panther movement. In San Francisco, the addictive multi-sensory eye candy that is Cirque du Soleil (www.cirquedusoleil.com) returns to AT&T Park with its newest high-concept spectacle Kurios: Cabinet of Curiosities (Nov 14-Jan 18), putting a stimulatingly steampunk spin on Cirque's patented assortment of high-wire acts, baby-talking clowns and acrobatic astonishments. At San Francisco's venerable American Conservatory Theater (www.americanconservatorytheater.org), huge buzz has been building over Irish playwright Colm Tóibín's meaty one-woman play, Testament (now through Nov 23). Featuring Canada's Seana McKenna as Mary, the mother of Jesus, the show portrays one of the world's most influential mothers, describing her fear and grief as her son's oratorical skills are gradually co-opted and his path redirected by the "apostles" she sees as dangerous fanatics. Though not as dangerous, perhaps, as the ones suggesting that there is good theater everywhere, if you are willing to look for it, and travel a bit.